Dressmakers, painters, henna artists are among the immigrant women - mostly Somalian - who have formed the Guuto Mothers Co-operative in Edmonton. Near where Zuhair Ali is standing, a mannequin wearing a guntiino dress is propped against a desk that is crowded with sewing materials and design sketches. The drab walls of the dimly lit room are covered with colourful Somali-inspired paintings. The small office space above Habesha African Market on 107th Avenue is home to the Guuto Mothers Co-operative, an initiative started by Ali this summer to help empower immigrant women in Edmonton. "We wanted to start this after we saw what was missing from the community, mostly from the other mothers," Ali said. "They have a lot of potential but they don't know what to do with it or how to go about it." The co-operative offers women — particularly recent immigrants from Somalia — the chance to build skills alongside others who share similar challenges. There are chefs, tailors, henna artists and designers among the roughly 20 members. Ali was a midwife in Somalia before moving to Canada in 2011. She took cleaning jobs for several years as she worked through three years of language classes at NorQuest College. Last year, she gathered a few like-minded friends to discuss the idea of building a co-operative. "Most of these mothers had skills and knowledge of all sorts back home. But when they came, there was no platform for them," she said, her son Omar Yahye translating. 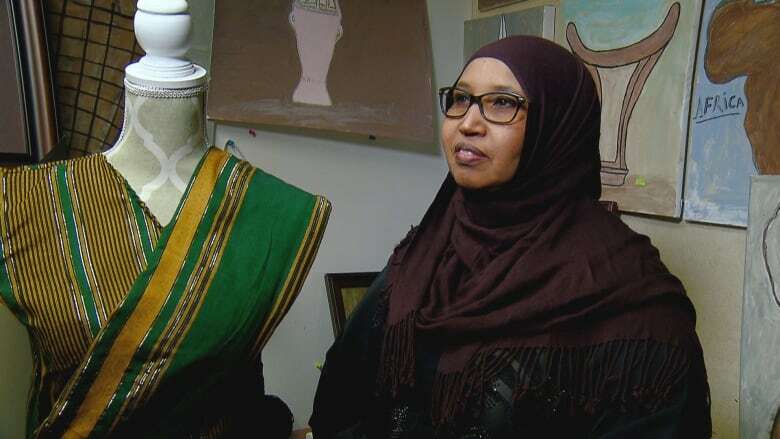 Somali women in Edmonton often have to buy their clothes from international retailers, said Tarik Accord, one of the co-operative's first members. By offering women locally sourced dresses, ranging from more traditional gowns to reimaginings of Somali designs, the co-operative is able to support the designers and women in the community. "We can make the money in that way for the community and ourselves to be proud," Accord said. She added that Somali women also face different intersections of oppression as being black and Muslim women. The constant interrogation of the way Muslim women dress, in particular, is isolating and makes it difficult to find a job. "The man doesn't get challenged the way that we are because everyone can see that we're Muslim. I want to keep my ritual and my culture, and I don't want to leave it," Accord said. Members contributed $10,000 to get the operation off the ground. The co-operative will get its first opportunity to reap the benefits of that investment during the Just One World Market Nov. 24-25 at St. Basil's Cultural Centre. The dream, Ali said, is to eventually open a storefront in Edmonton and distribute their wares to retail locations around the city. "We want to be able to help the newcomers from any nation. To take them out of poverty and all the stuff that they're feeling. We want it to be there for everybody."